Home / Adults / Winter Holiday Season Handcrafting Opportunities! Winter Holiday Season Handcrafting Opportunities! The winter holiday season has arrived and many of us are thinking about gift-giving, which for folks who like to use their hands, means that the season of gift-making has begun. In my humble opinion, hand making gifts is, hands down, much more satisfying than shopping for gifts at the mall or online. If you’d like to give a handmade gift this season, there are two fun and interesting crafting options being offered by DBRL for you to try: basket weaving and needle felting with wool. Both are tactility and visually pleasing activities and if approached with a relaxed attitude (no hurrying yourself), then you might find the repetitive nature of this work to be a soothing agent to any holiday stress you’ve accumulated. First up: basket weaving (or basket making, if you prefer). Everyone knows what a basket is, right? It’s a vessel or container, created by weaving pliable materials together. Probably every single one of us has at least one basket in our house, but most likely several or many of various shapes and sizes, used for storing something like dinner napkins, or for serving bread at the dining table. 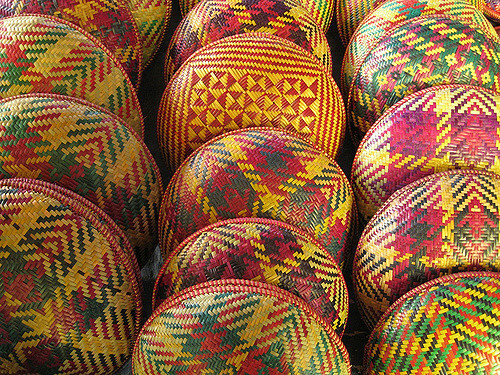 Baskets are a form of functional art and have lent beauty to the rituals of daily living for thousands of years. This ancient craft, dating back to at least as early as 12,000 years ago, can be done utilizing traditional materials (i.e. vines, grasses, pine needles, reeds, etc.) or using less conventional materials, like paper strips or wire. I’m intrigued by the idea of upcycling materials, such as worn out clothing, to fashion a basket, thereby making functional art from something that would otherwise end up in the landfill. If you’d like to weave a basket, come by Southern Boone County Public Library on Saturday, December 8, from 1-3 p.m. Materials will be provided. Your second crafting option is to create felt using wool. Felt is the oldest known textile and has versatile capabilities. It can be fashioned for cozy wintertime use in the form of hats, slippers, vests, or even a covering for a particular type of house! It can also be used to craft puppets or ornaments. Interestingly, making felt fabric does not require weaving thread on a loom (low-tech! ), rather; it’s a totally different process. Many mammal fibers (including human hair) have scales along their shafts. But some mammal fibers like wool from sheep (also alpaca, cashmere and angora among others) have longer, pointier scales that, when subjected to agitation, moisture and heat, cause these scaly fibers to flare open, then lock together and shrink down. Thus, if wool fibers are layered in sheets and then subjected to this process, a dense piece of fabric can be made. There is another technique to use to transform wool into felt which is the focus of our second program. 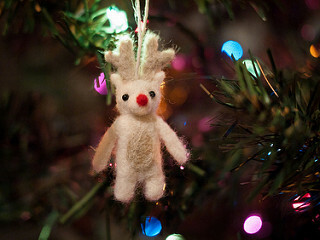 In this mini-workshop you will create an ornament by needle felting. Using a notched needle, you will repeatedly punch wool fibers together, causing the scaly fibers to compact and lock together. Please join us at the Callaway County Public Library on Saturday, December 15, from 1-3 p.m. to try your hand at needle felting. Materials will be provided. Wishing you happy hours of handcrafting this holiday season!